Orange County Supervisor and District Attorney-elect Todd Spitzer sharply criticized Los Angeles city officials Wednesday, especially Mayor Eric Garcetti, saying it is reckless to allow the homeless to set campfires. "The unimaginable horror faced by California residents and firefighters who watched a monstrous wall of flame obliterate an entire town is a tragedy that most of us will remember forever," Spitzer wrote in an opinion piece published in the Orange County Register. "In the end, it's the job of elected officials to set the highest standards of public safety so that we at least have a fighting chance in the future of controlling something like this." Spitzer wrote that in the past three decades as a California Assembly member and an Orange County supervisor, he has been consumed with giving firefighters, police, and prosecutors the support they need to excel at their jobs despite budget cuts and rising crime. "So it was with great concern and disbelief that I watched a recent news report detailing how Los Angeles city officials have condoned campfires by homeless individuals in the extremely dry, mountainous brush areas. 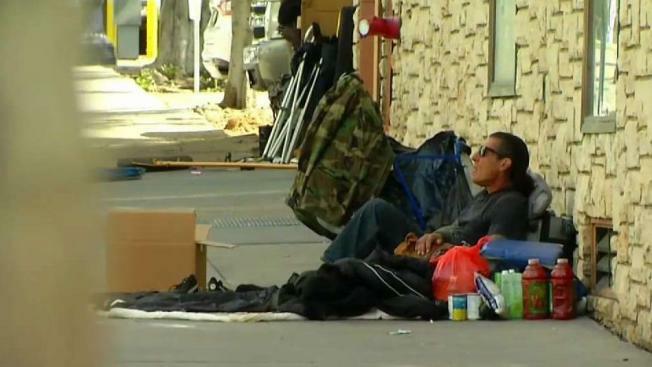 The Los Angeles mayor said the vagrants could not be arrested because the city does not have "No Trespassing" signs posted in the area. Instead, he dispatched a team of counselors with no law enforcement authority to roust the homeless. This was met with limited success. "It's unclear to me how many signs Mayor Eric Garcetti thinks he would need to cover the Santa Monica Mountains behind Bel Air and the Getty Museum. Apparently he is more concerned with creating bureaucracy than with the lives of citizens." In Orange County, he added, "we do not allow the lives and well-being of our residents to be placed at risk by the homeless population. I led efforts with my Board colleagues to clear homeless encampments from three miles along the Santa Ana River and place the individuals in shelters." In November, he wrote, two Los Angeles brush fires started in homeless encampments, including one that involved Griffith Park. "And who can forget the massive Skirball fire last year that burned down six Bel Air homes, which not surprisingly was caused by vagrants who were cooking a meal." "It's logical to assume that the dense brush on the hillsides is an attractive place to build a campsite and create a makeshift galley for breakfast, lunch and dinner. To not vigorously enforce the area as a no-fire zone is just plain reckless." Spitzer wrote that as district attorney, he will have "the authority to set an example for the rest of the state regarding a no-tolerance stance on homeless firebugs or any other type of homeless crime. Many of these individuals just need a lucky break to get on their feet and I will continue to help with this effort, as I have for the past eight years. However, I will not tolerate anyone who violates our laws and jeopardizes our community safety. I hope Los Angeles can follow this lead."